Have you ever wanted just a little cake right now? 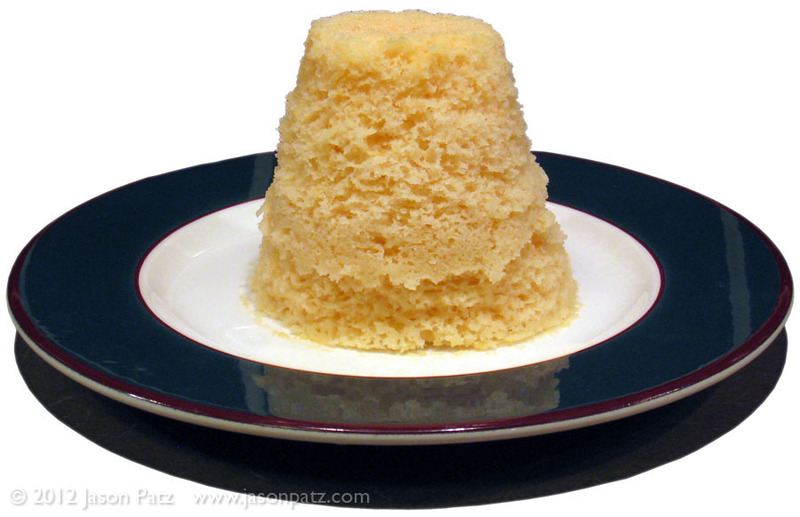 Well, a friend of mine explained a super simple way to make cake that is actually healthier than regular cake, tastes pretty good, and goes from cup to mouth in about one minute. I know it sounds impossible but it really works. 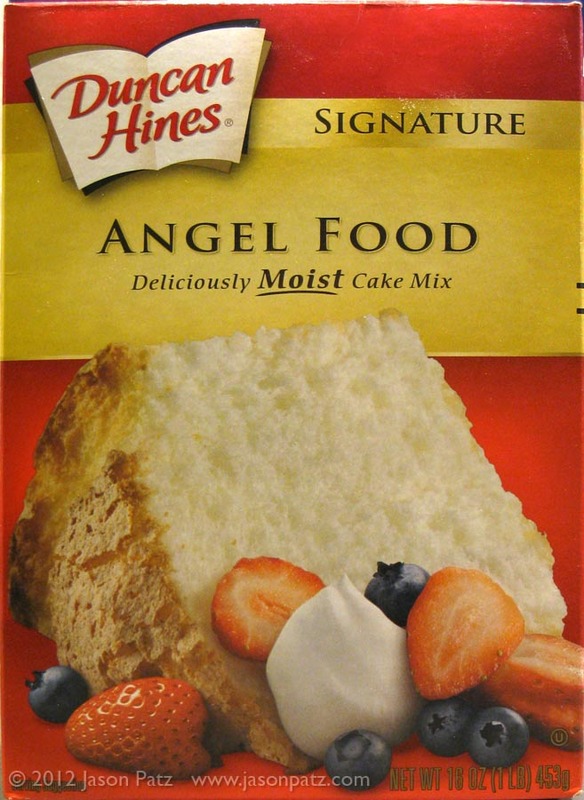 The secret is using angel food cake mix because it already has the egg whites in it. It is so simple that rather than give you a recipe, I thought I’d just show you pictorially. While cooking and cooling, the cake will have a moderately farty smell (I assume from the egg whites). I expected the cake to be really tough or hard but it is actually more delicate than a normal cake. It can be frosted though. 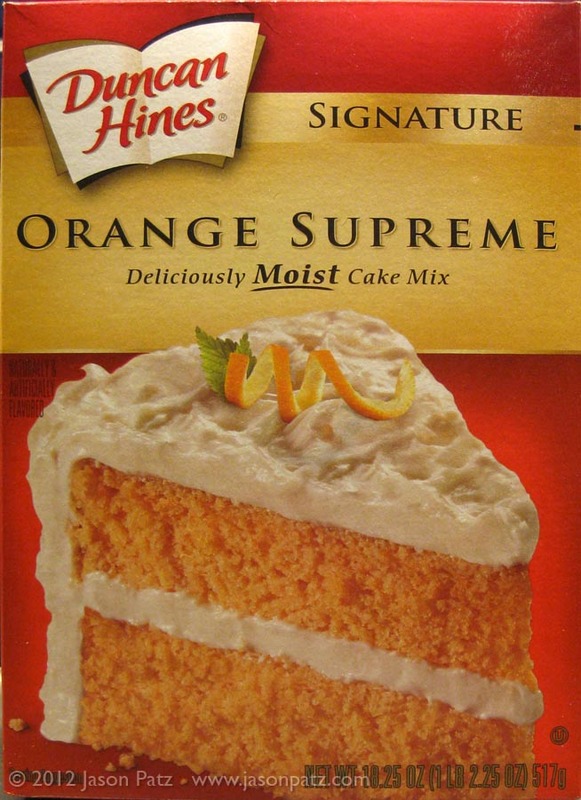 It isn’t nearly as good as “real” cake but overall is a nice substitute when a small cake emergency arises. If you end up giving this recipe a try, let me know what variations you tried and how well they worked in the comments below. 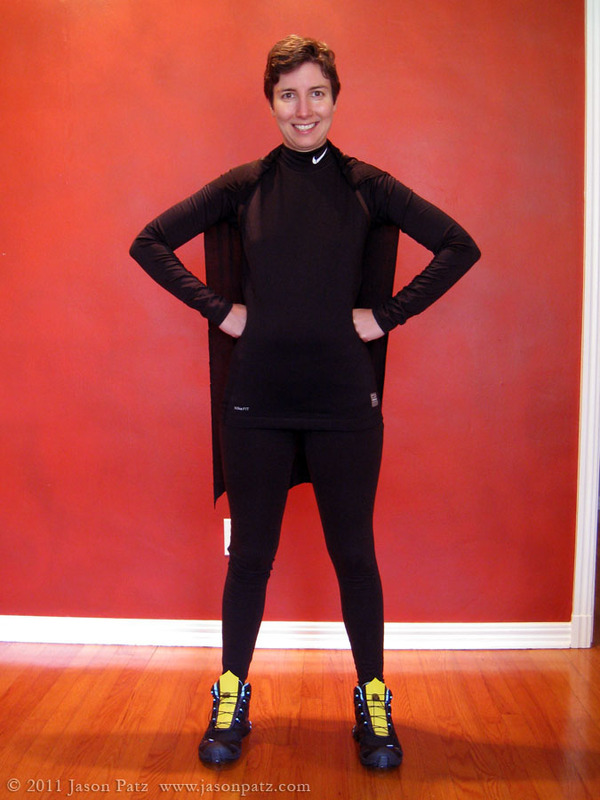 As detailed in my how to make a Green Lantern costume post, we have been asked to dress as superheroes this year – specifically Green Lantern and Catwoman. While doing an image search for Catwoman, I started running across articles discussing how adult superhero comic books are becoming and that she is at the forefront of this shift. I won’t post any links as those images are NSFW. Needless to say, Melanie will be Batwoman for Halloween this year. We decided to make a sort of mash-up of Batwoman and Batgirl. Between the two, there have been many different costumes from the comic books, TV show and movies. The version we settled on has an active high contrast black and yellow color pallet and rugged details reminiscent of Frank Miller’s Batman. I really liked the interpretation shown here (except for the skewed belt and leggy wrap thing). My only concern with this costume was the mask. I’m not a great seamstress and a mask could be challenging. I knew making it out of spandex would be a big help. Since it is so stretchy, it would be forgiving of a less-than-perfect shape. I didn’t realize just how easy it would be until I saw this video. Once I realized I could get away with a tube that would stretch to fit, I knew it wouldn’t be a problem. First we took an edge of the spandex and wrapped it snugly around Melanie’s head to see how big of a tube we needed. 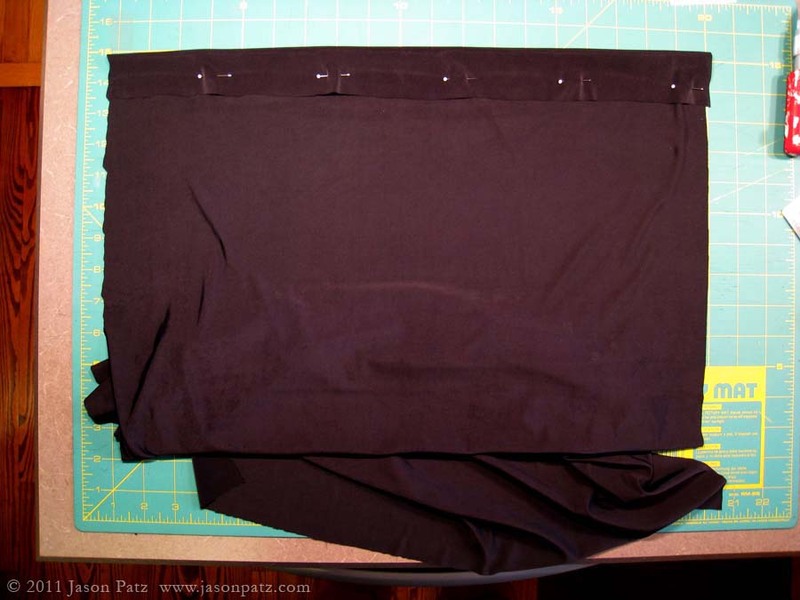 Next I pinned it up, cut it out and sewed it together up one side to create the tube. 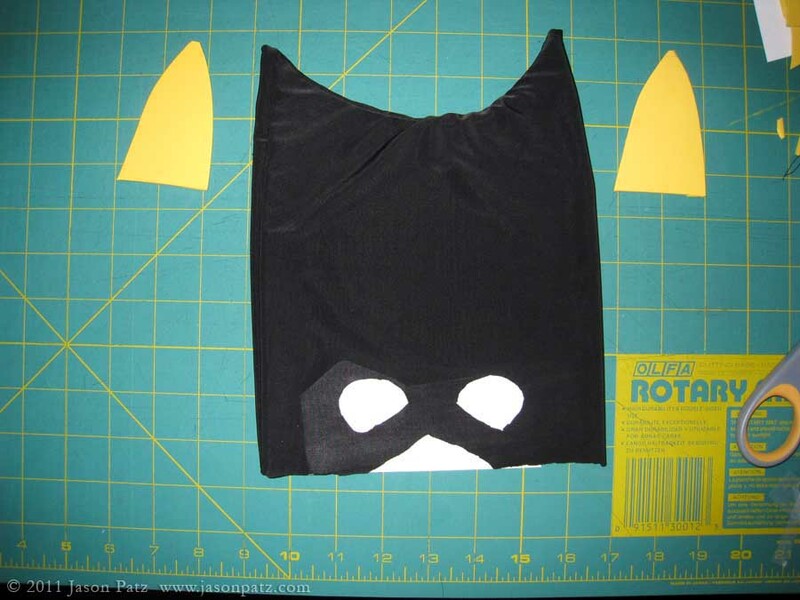 Second we added a curved cut and sewed the top to create the ears. After that we turned the mask right side out to hide the sewn edges. Melanie tried the mask on and we marked for eye holes and a small nose ridge. We tried to keep the holes small at first as we knew the material would stretch when she wore it. 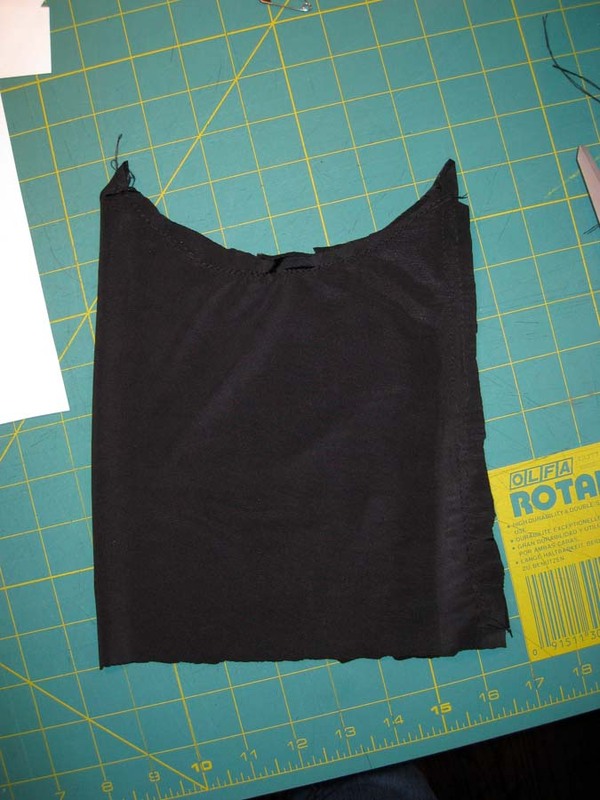 We left all the cut edges raw since this fabric doesn’t unravel easily and it will probably only be worn one time. After a test fit I noticed that the ears stood up but were a little flabby. I made a couple of inserts out of some sheet foam (this stuff is awesome and cheap). 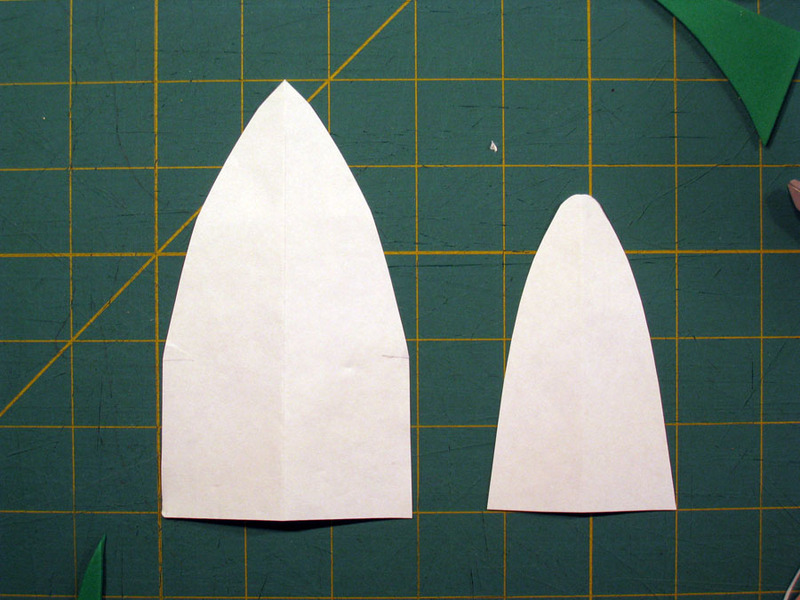 I guessed on the first set and then recut some a little bit larger to get them into a nicer shape. I have to imagine that one of the best parts of getting to draw Batman is putting your own spin on his logo. There have been a huge number of different logos over the years but the one we settled on is from one (or more?) of the recent movies. Its linear and angular nature lend well to the tougher harder look we were going for. 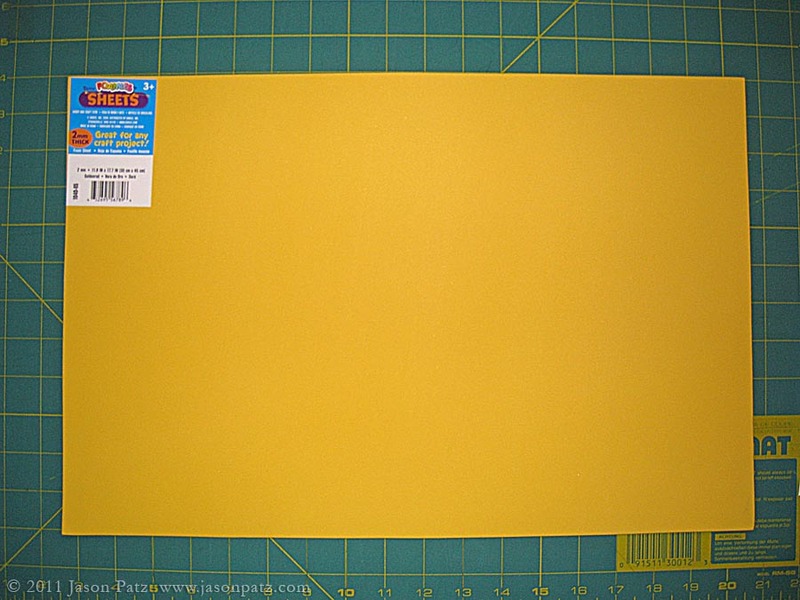 We sized the image for Melanie’s shirt and cut it out of the yellow Foamies sheet foam. It is attached to her shirt with two stiches of yellow thread that can easily be removed without damaging the shirt (We were rushing to get pictures taken before the sun set so it is shown taped on below). 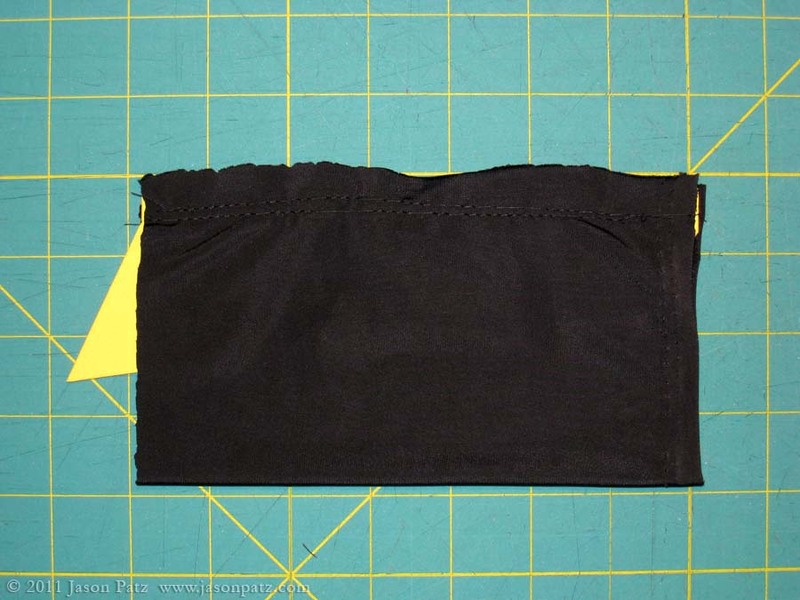 Once the glue dried, we sewed and glued two strips of Velcro on the ends of the belt so it can be attached from behind. All parts were glued together with a super strong PVA glue that I’ve used since school called Sobo. 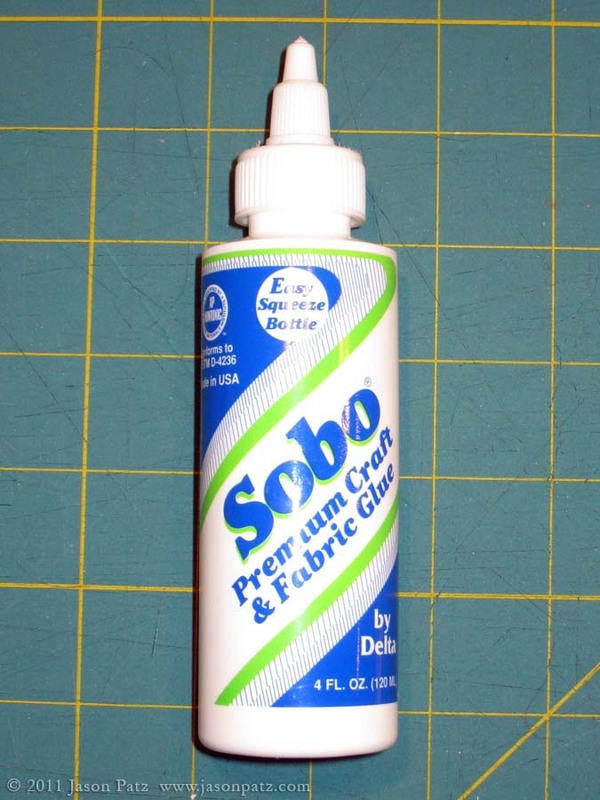 It is basically a thicker, stickier version of Elmer’s glue. I would think any kind of flexible strong glue would work for this project. I would not use Elmer’s though. 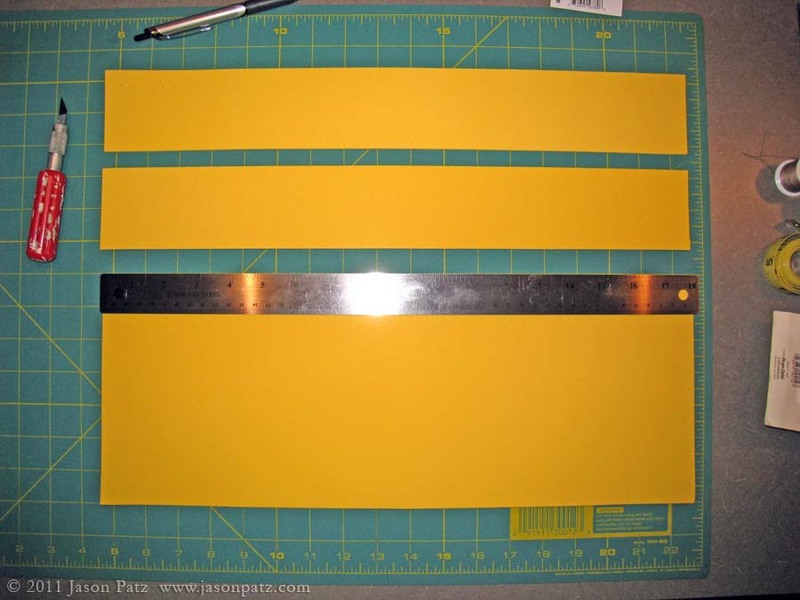 Next we cut out yellow fins from the sheet foam adding an extra ½” to the bottom where they could be sewn into the spandex. 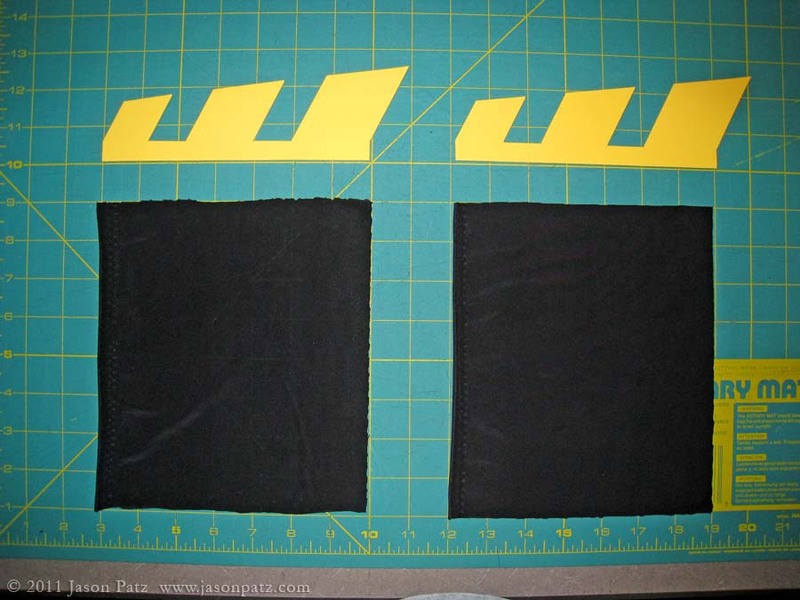 We also cut out rectangles of the spandex that could wrap Melanie’s arms over her shirt comfortably. 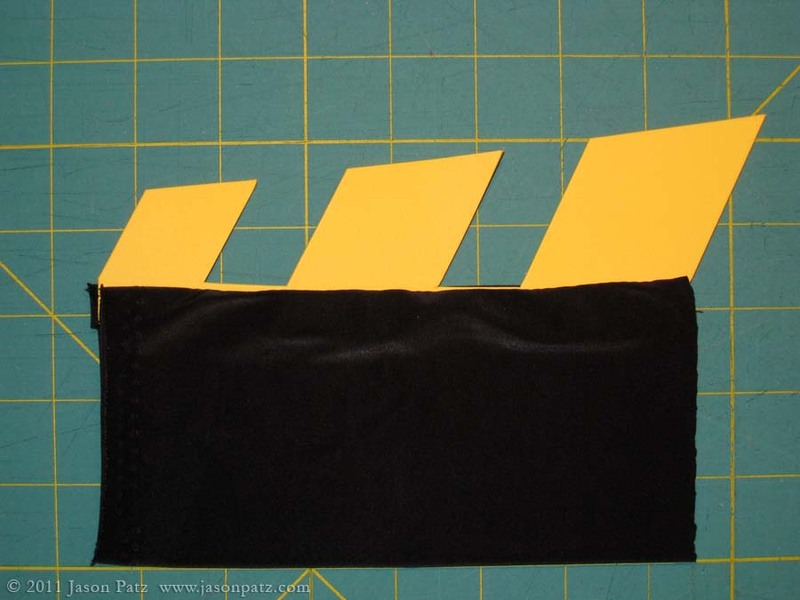 Next the fabric was folded in half and the fin was placed inside along the edge. 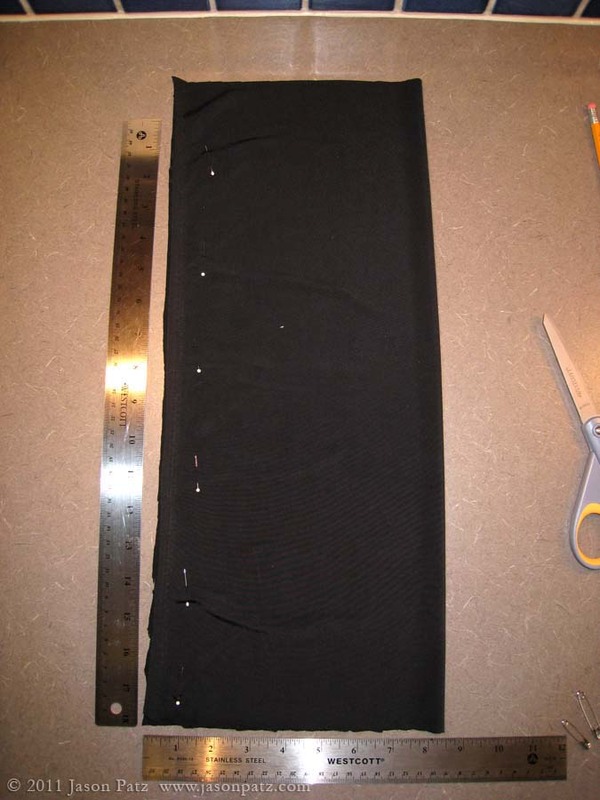 Then the edge that the fins touched was stitched, joining the fins to the fabric. The fabric was turned inside out to create the finished gauntlet. 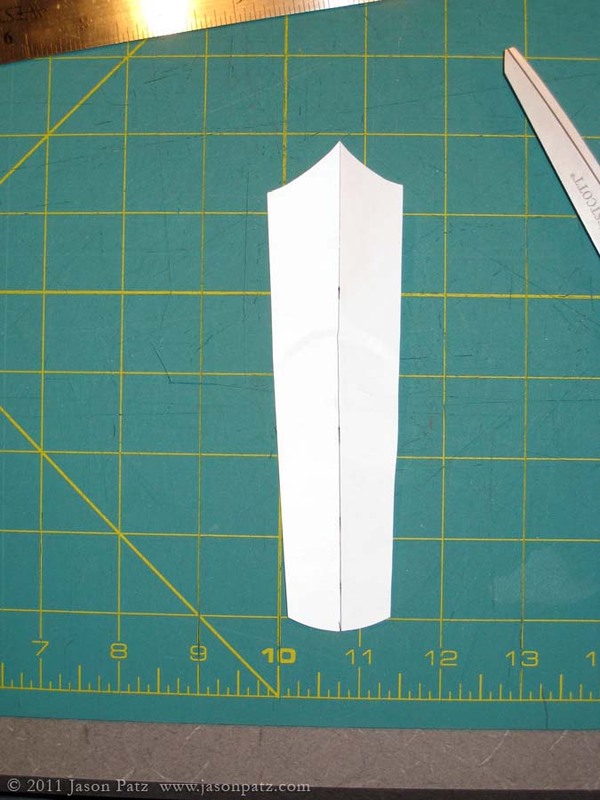 The ends of the fabric tube were left unfinished. 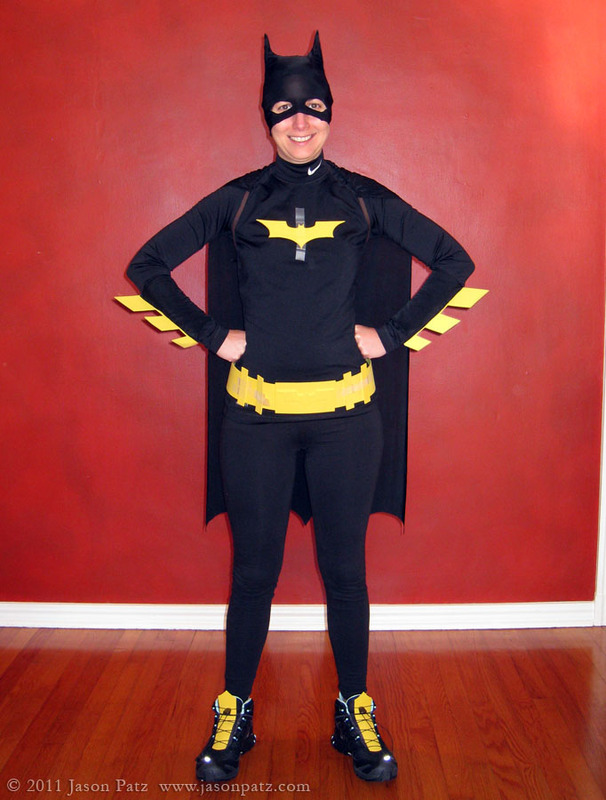 We wanted to add some yellow to the bottom of the costume but were not willing to buy yellow boots. 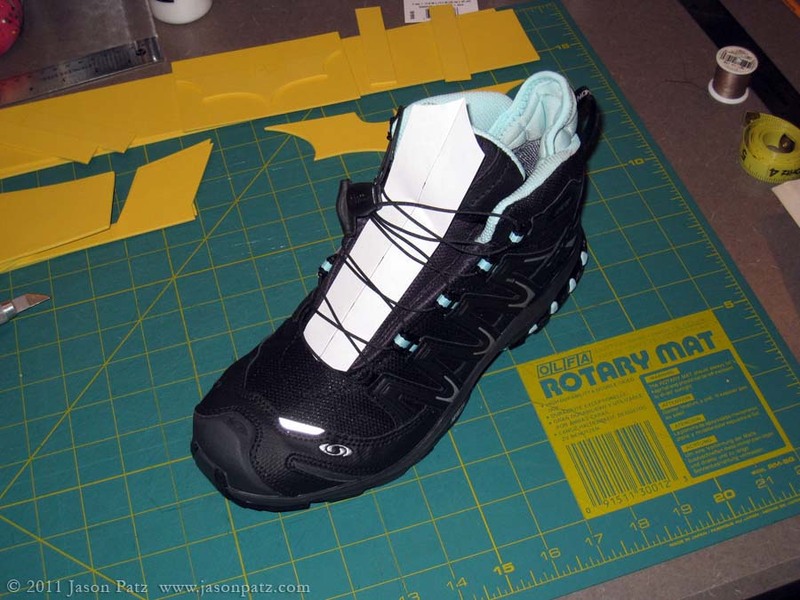 Most homemade shoe covers that simulate boots look terrible and don’t stay on. We came up with a solution I like very much. In keeping with the tough look, Melanie will wear her black hiking boots and we just made a little yellow insert to stick between the laces and the tongue of the boot. It worked out great! We were trying to do this costume ultra cheap and originally were not going to have a cape but it turned out that we had just enough fabric left to make a decent one. If it were a fully designed part of this costume I would have made it wider and longer but it works as is. And besides, shorter is better for fighting crime. 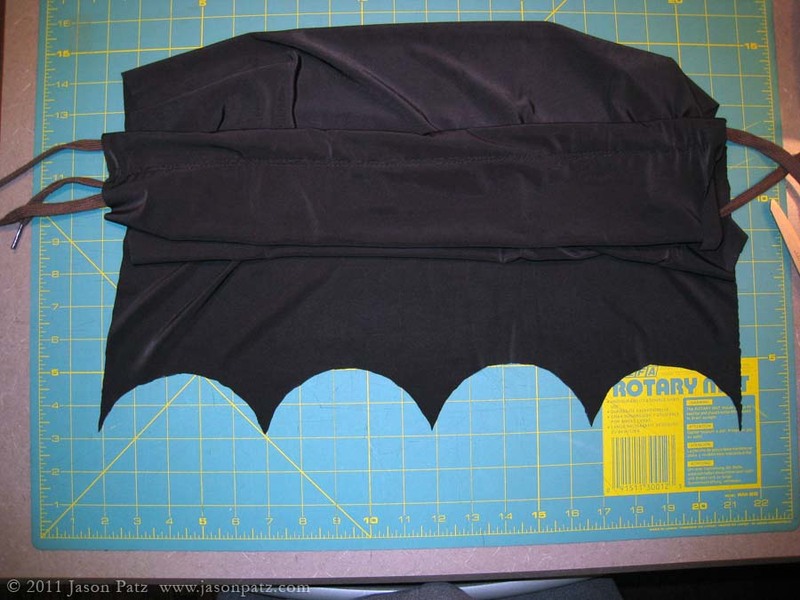 First, we folded over a section of the cape at one end just large enough to get a shoelace easily through, then we pinned and sewed it. So we had a small tube at one end of a large rectangle of fabric. Next we ran a shoelace through this tube and test fit the cape. 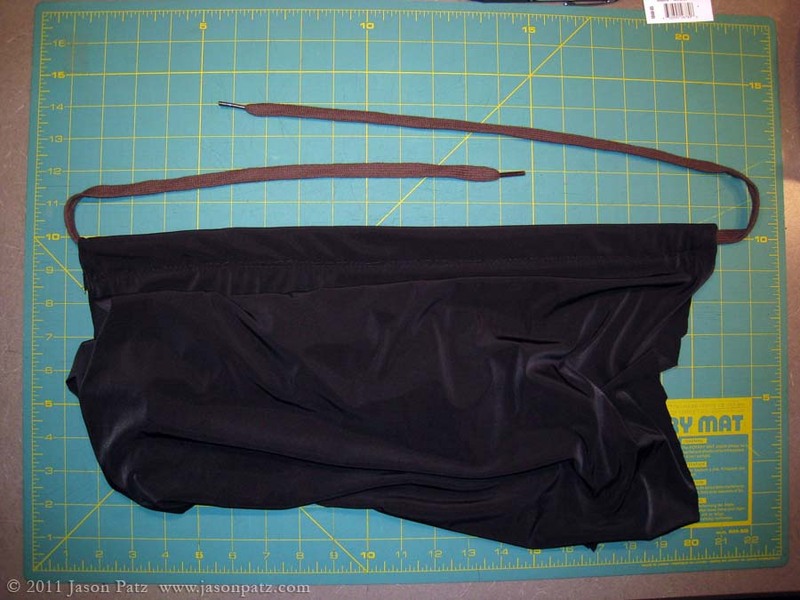 The cape is attached by wrapping the ends of the shoelace over the front of the shoulders and then passing them through the armpit area and tying them together in the middle of the back. This provides a very clean look for the cape with no need for a front clasp or knot under the throat. Next we marked where we wanted the bottom of the cape to be. 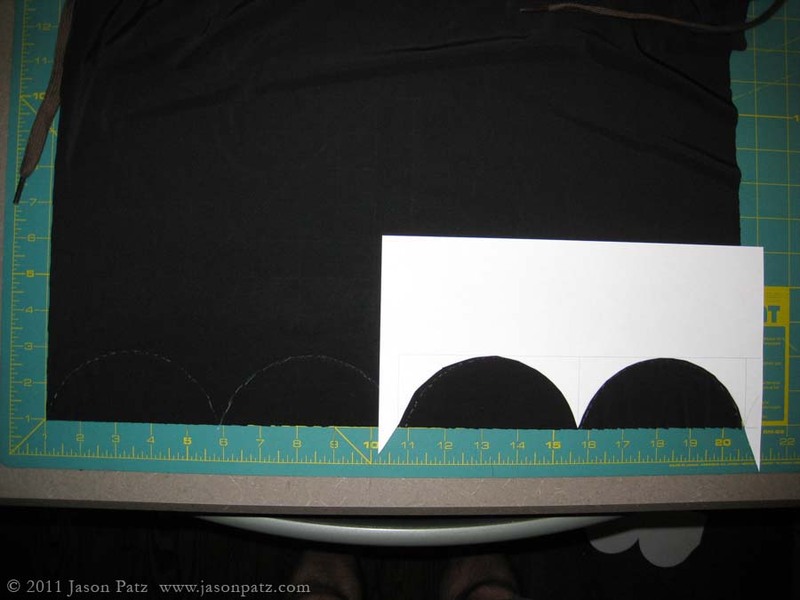 Finally, we cut a scallop pattern in the bottom of the cape and left all of the edges raw. We are both really pleased with how this costume turned out and how cheap it is. Melanie already had a black shirt, black leggings and black boots. The only things we had to buy for this costume were half a yard of “black swimwear lining” and a sheet of yellow Foamies. Total retail price: $6! We had a coupon so it only cost us $3.50! I found out recently that we would be attending a Halloween event for kids and they hoped that we would wear costumes too. Their theme for the evening will be superheroes and it was requested that I dress as Green Lantern and Melanie dress as Catwoman. We didn’t want to spend a lot of time or money on the costumes but we wanted them to at least be decent. 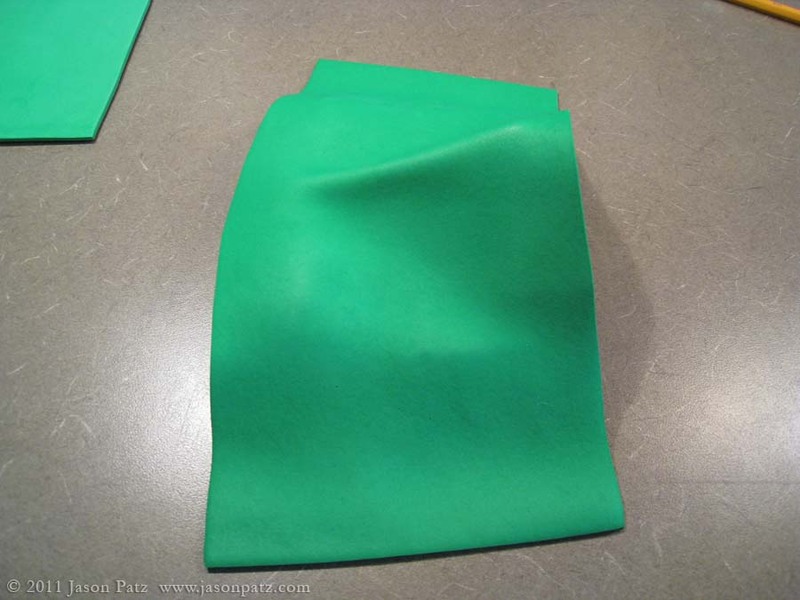 This article will detail how I made my Green Lantern costume. I’ll write a separate article for Melanie’s costume. 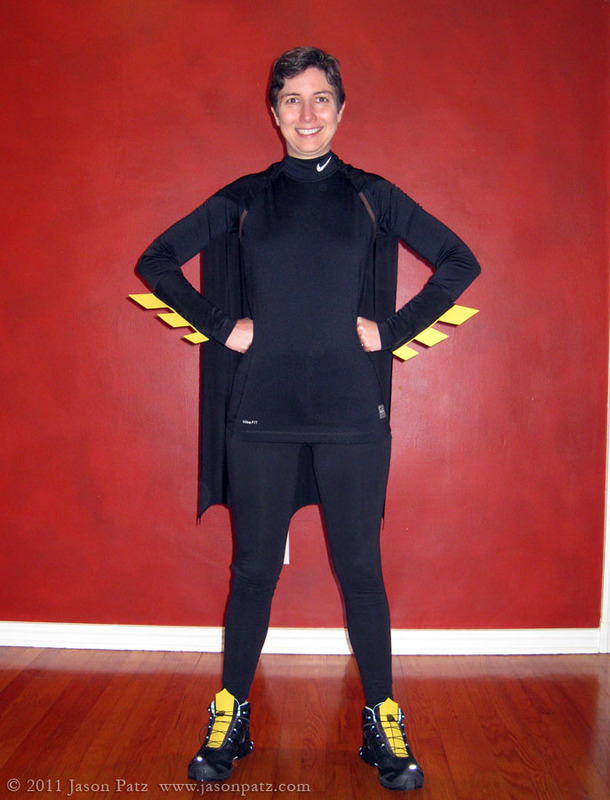 It didn’t take much thinking to realize that my costume should be quick and easy to make. The members of the Green Lantern Corps come in all shapes, sizes and colors and so do their costumes. This meant my costume could pretty much look like anything as long as I had an emblem on me somewhere and wore a power ring. 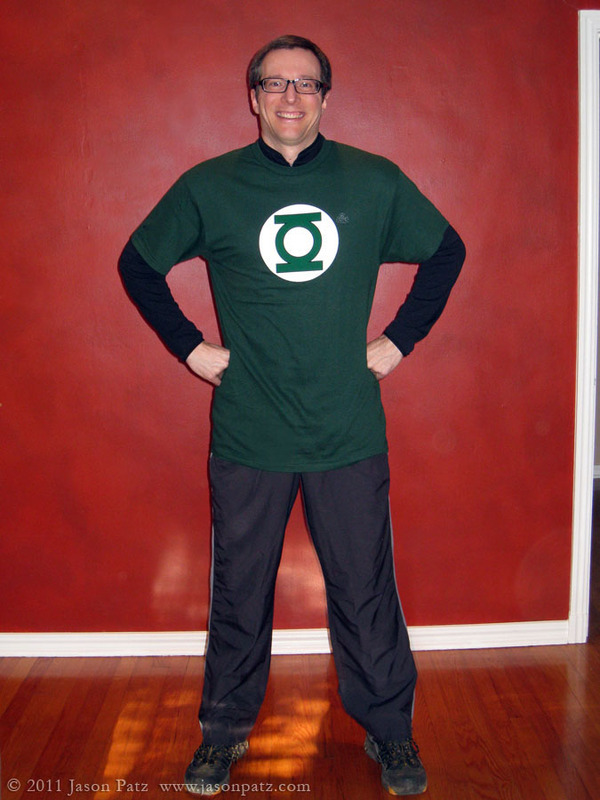 Hal Jordan is my favorite lantern and he actually wears one of my favorite superhero costumes so I decided to try and look somewhat like him – maybe his cousin, Sal Jordan. 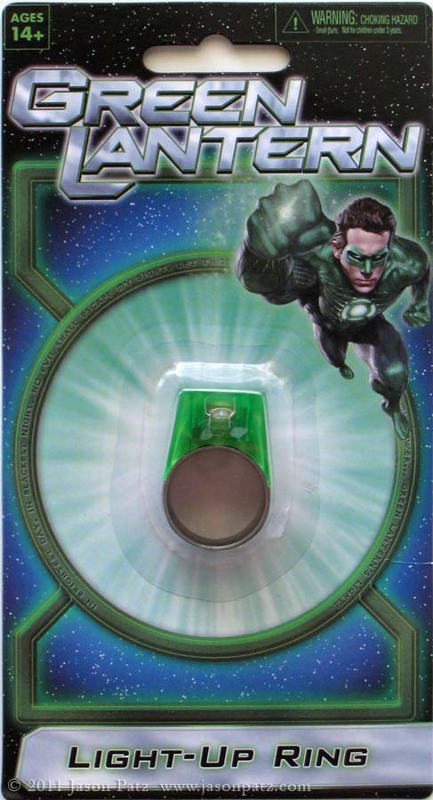 Hal wears a simple green mask that is “held on by his willpower” without any strings or straps. 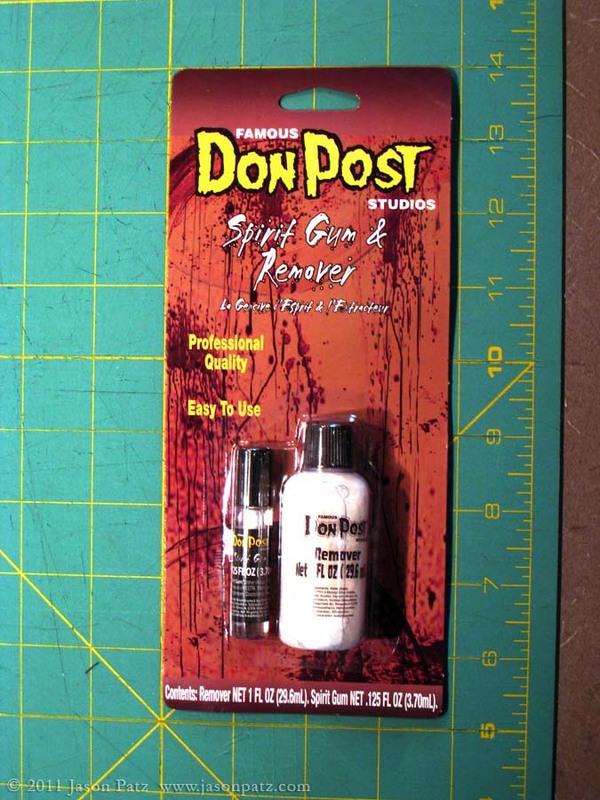 I thought this would be a neat opportunity to experiment with spirit gum, the special effects glue that is used to hold on fake beards, Klingon head lobsters and such. 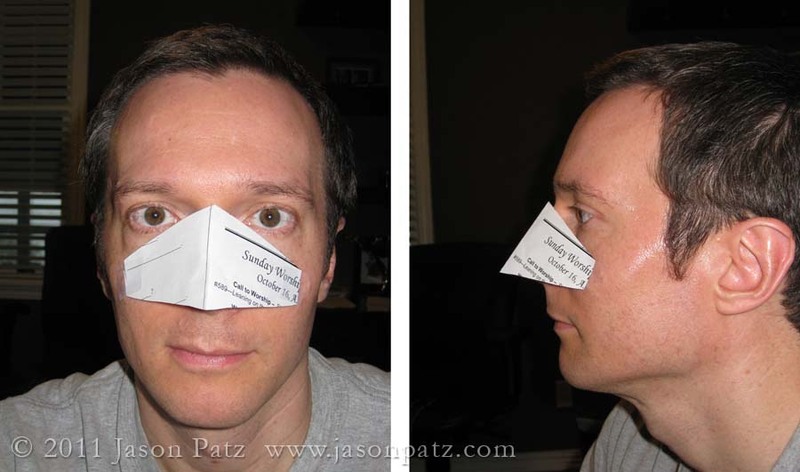 I haven’t actually tried that part out yet since it is a one-shot deal but if it doesn’t work, I’ll just punch two little holes and attach the mask to my face using black string. 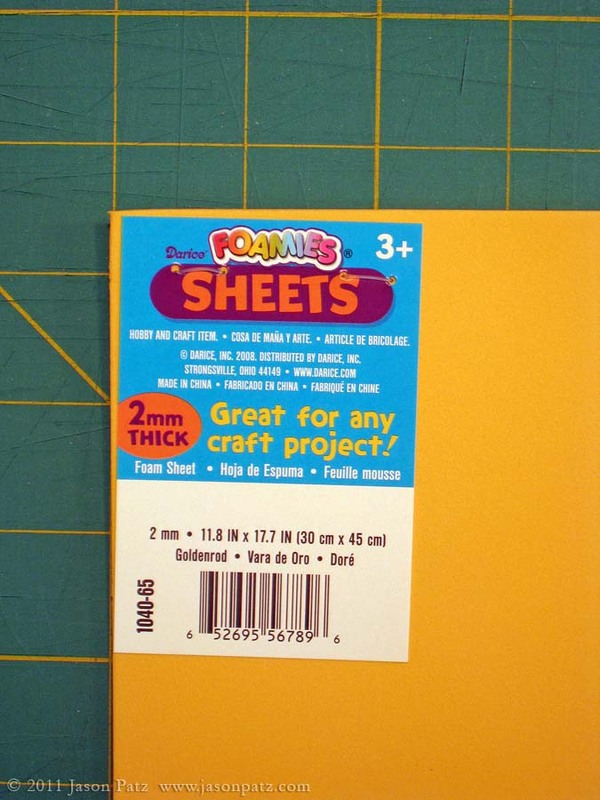 I knew that it needed to be lightweight, so cheap options included paper, fabric and a cool sheet foam material I’d tried out recently when I made a Golden Ticket. 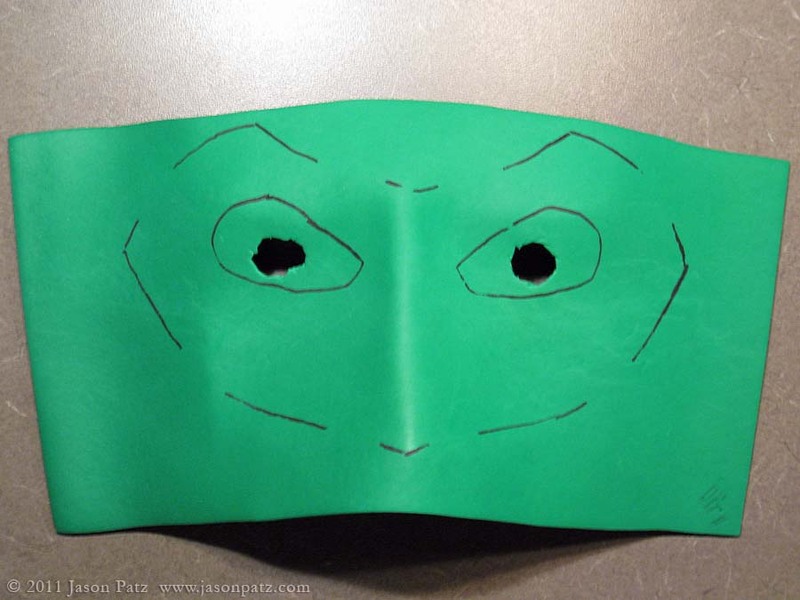 I also found this video which details how to turn a sheet of this material into a mask. How simple. Decision made! 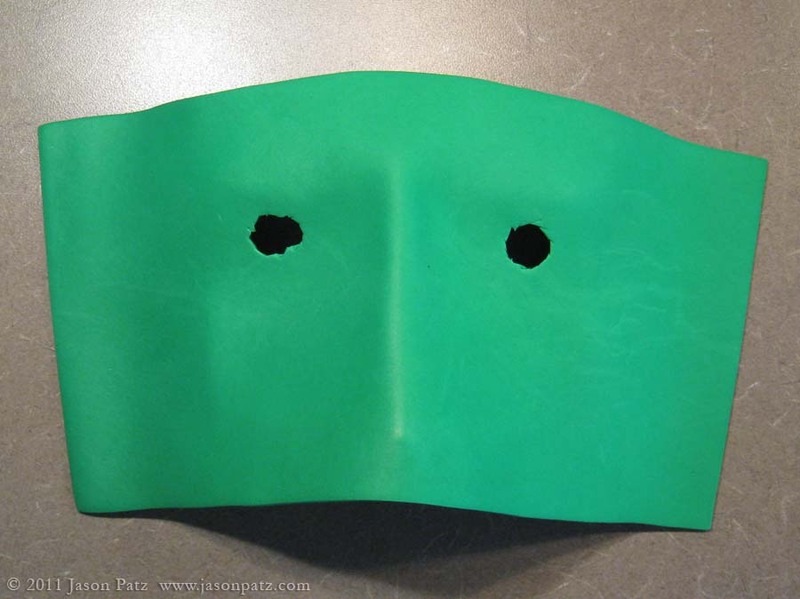 I made my mask out of green Foamies sheet foam. 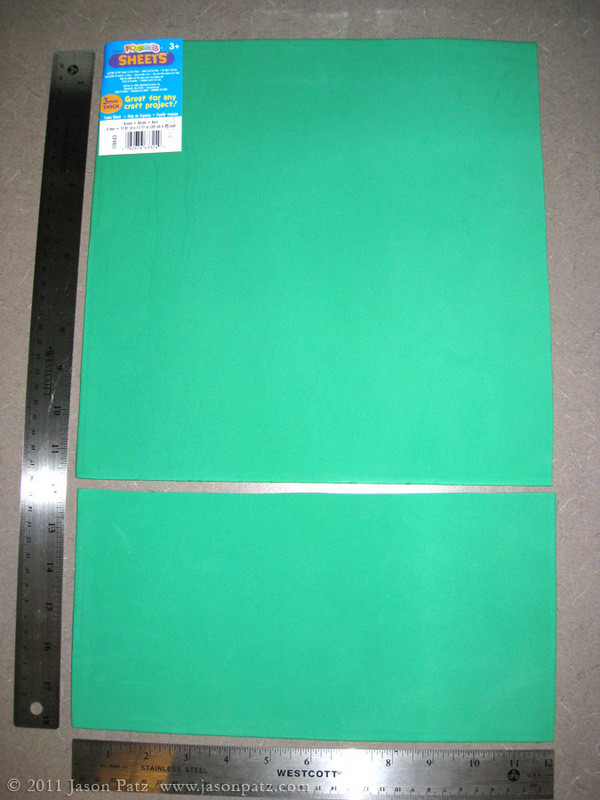 It cost about $1.50 for a roughly 12”x18” 2mm or 3mm sheet. 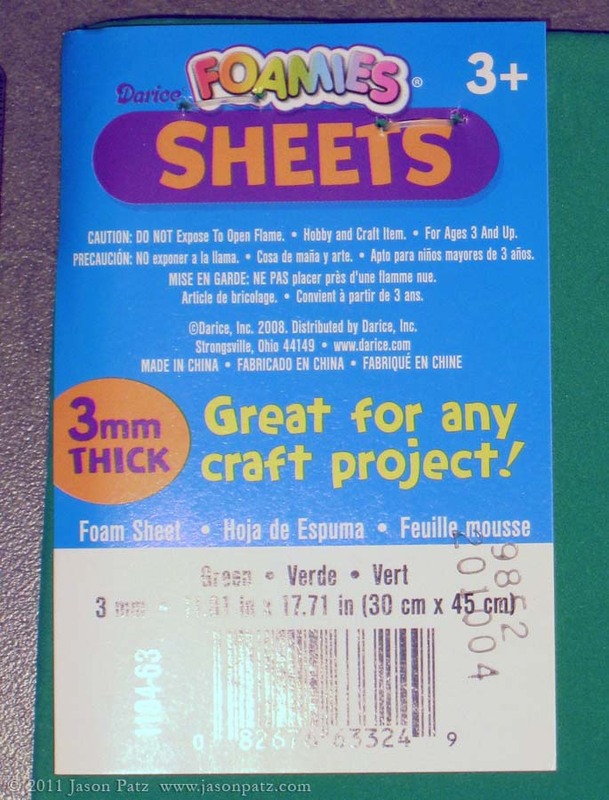 It comes in various thicknesses, sizes, colors and is available at most art supply and craft stores. They only had one shade of green when I was looking. It would have been nice if it was a little darker, but for $1.50, I’m not complaining. 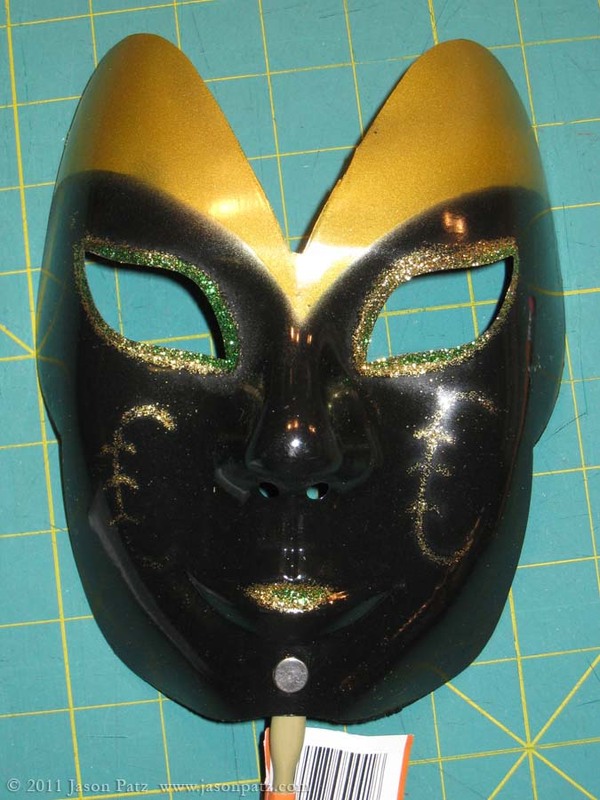 Alternatively, the mask could be done away with completely or drawn on with green face paint. Because I was unwilling to spend the money on two adult Batman masks as detailed in the how-to video, I had to make my own mold. A trip to the Halloween isle at the dollar store got me this hard plastic face mask. 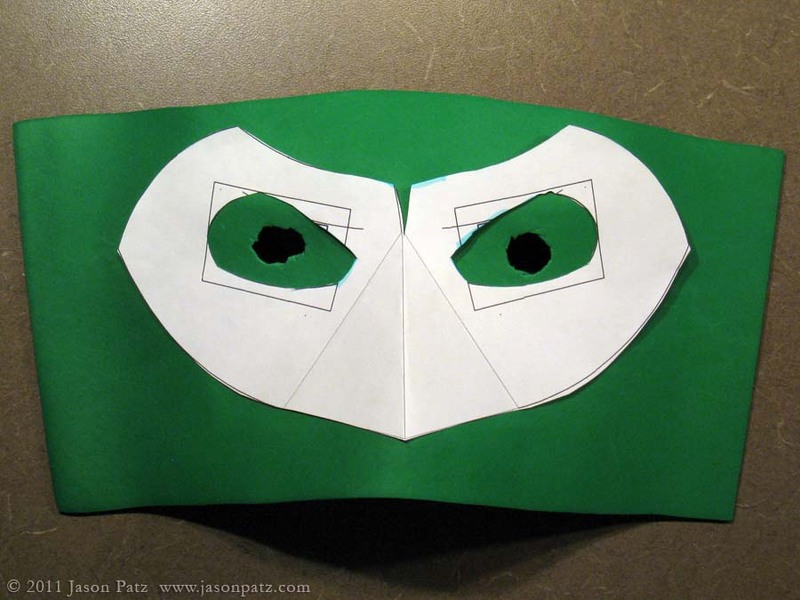 I then determined the size and shape of the beak portion of the mask with paper. 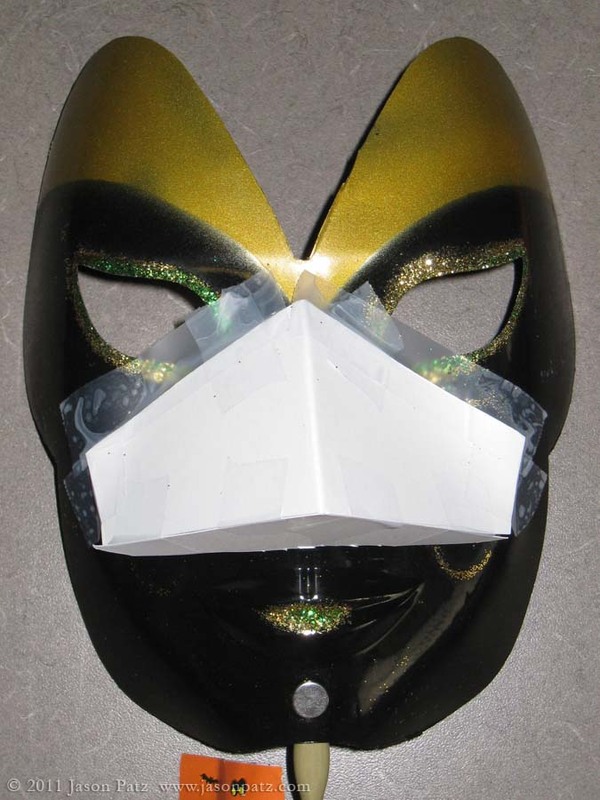 Next the paper pattern was transferred to a more sturdy mat board and taped to the mask. 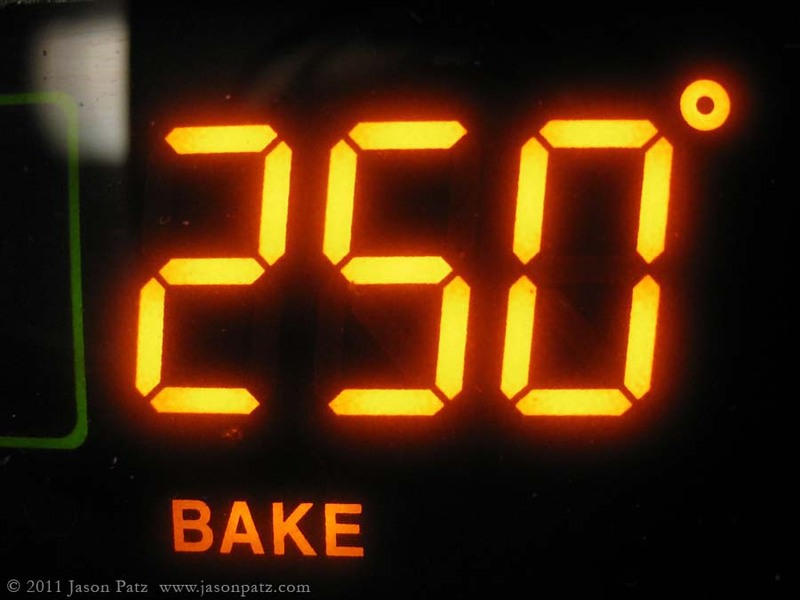 Next I cut a roughly six inch piece of sheet foam and placed it in a 250 degree oven for about four minutes. Basically, what you are trying to do is let the foam get hot enough to begin to slump but not so hot that it melts or burns (I don’t think it would do either at this temperature). Incidentally, I don’t know if this material gives off any harmful gasses when heated, but I didn’t detect any odd smells or notice a change in the material other than it softened (unlike vacuum forming plastic). I would guess that it is completely safe but, since I don’t know for sure, you should work in a well-ventilated area and wear a high-end respirator mask that blocks out all fumes and toxins just to be safe. 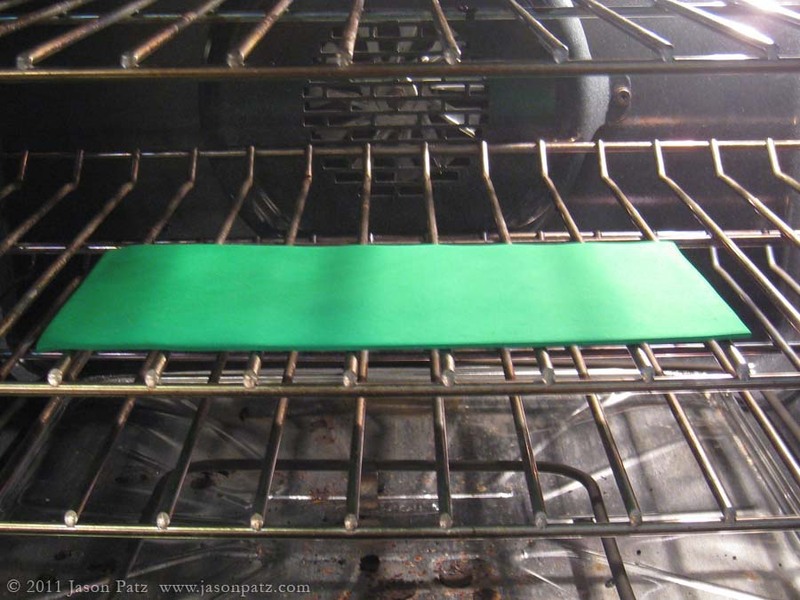 Once the foam sheet softened, I removed it from the oven with a wooden spoon (the foam wasn’t that hot but the rack in the oven was). Working quickly, I placed the foam on the mold and used my hands to press it in place. I held it for about a minute at which point the foam was cool and had taken on its new shape. Simple, fast, cheap! Then I measured my eyes center to center and made small cuts in the foam at these points. I enlarged these holes enough to determine exactly where my eye holes needed to be. 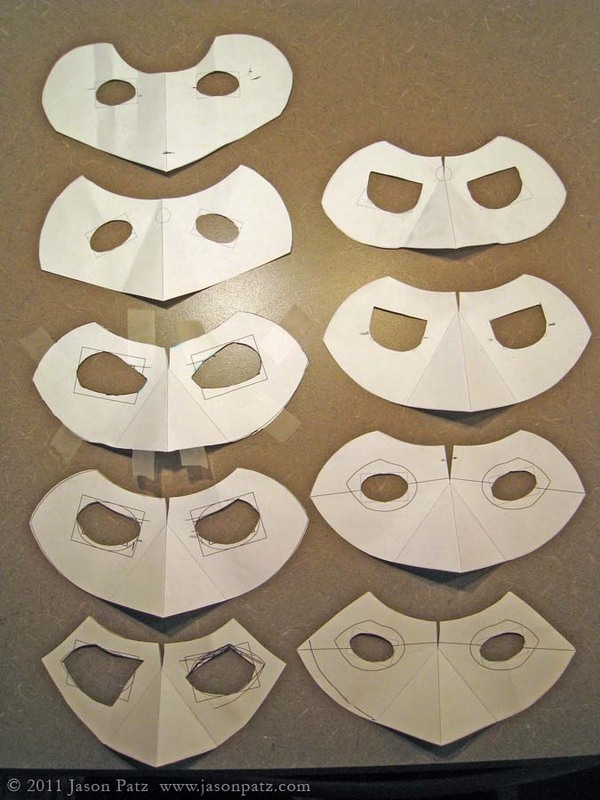 From there I sketched out paper patterns and put them on my face to finalize the shape and size of the mask. Of both costumes, this was surprisingly the single most time consuming step and I went through several iterations. 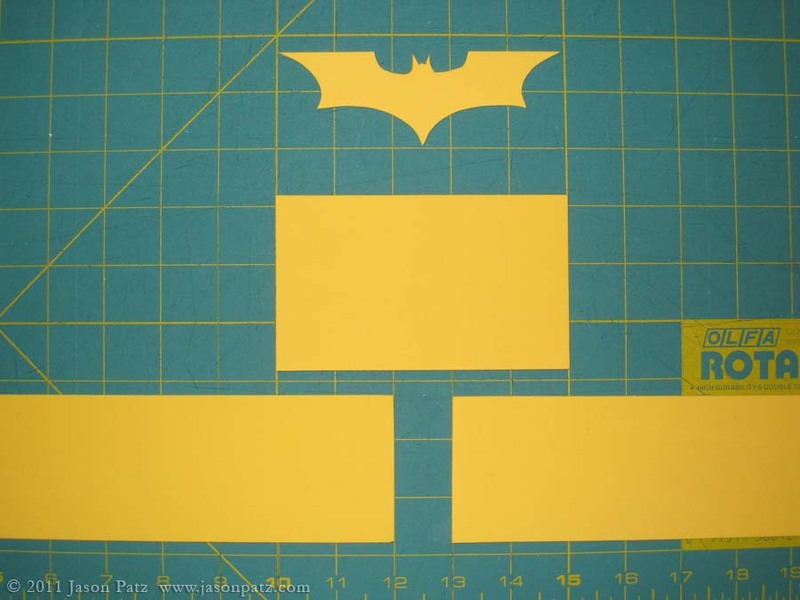 If you opt to use the double Batman mask molding option from the video, it will be much easier as all of the details will be pressed right into the foam. From there, I just laid the pattern over the formed foam, lining up the eye holes on the pattern with the eye holes on foam and traced it with a pen. 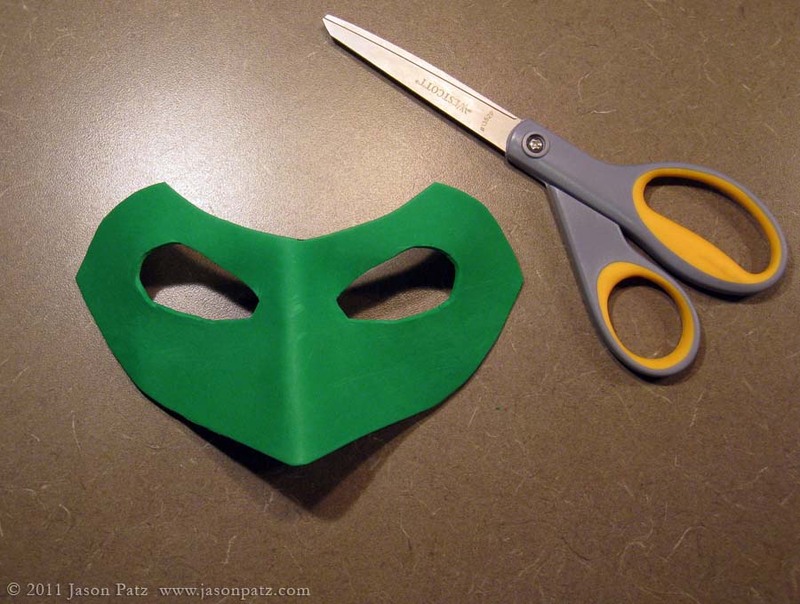 Finally, I used a pair of scissors to cut the mask to its final shape. I looked into building my own but when I discovered that they make both kid and adult-sized movie prop replicas that light up for less than $5, I was sold. I couldn’t make a decent copy that cheap. Apparently the ones you see in most stores that come packed with a little plastic mask are kid-sized. The one I ordered came individually packaged and fits my normal-to-slender adult-sized finger. It lights up and is brighter than I expected but the battery isn’t replaceable and it only stays lit for a few seconds each time the button is pressed. I was sad that it wasn’t eligible for Amazon’s Super Saver shipping because it ended up costing just as much to ship it as to buy it. 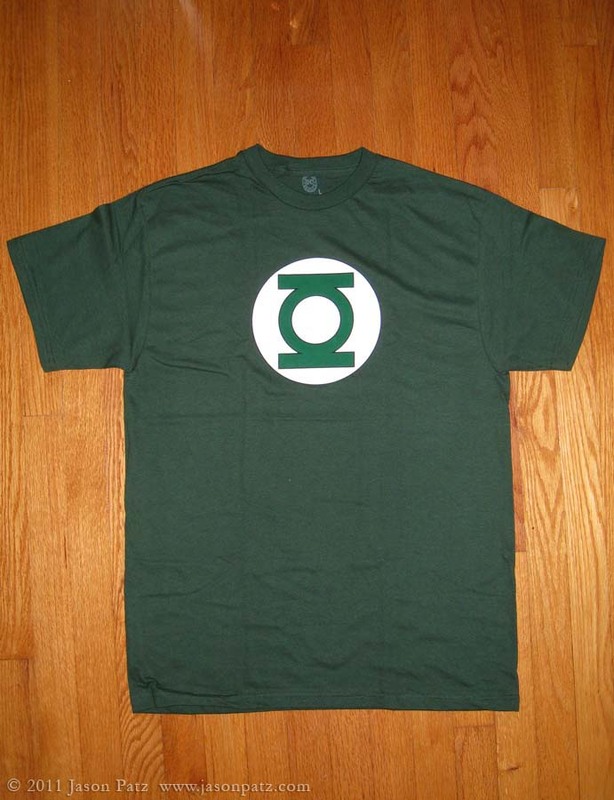 To finish things off, I bought a shirt with a Green Lantern logo on it. I had one of these years ago and this new one is a much nicer darker green than the old bright green one I had. My biggest problem with it is that the green in the insignia is screen printed on and it isn’t exactly the same color as the shirt. It isn’t the end of the world though and now I’ll be able to wear the shirt even after Halloween. If you don’t want to spend $14 on the shirt, you could easily cut the emblem out of sheet foam, felt or paper and just sew or pin it to a shirt. 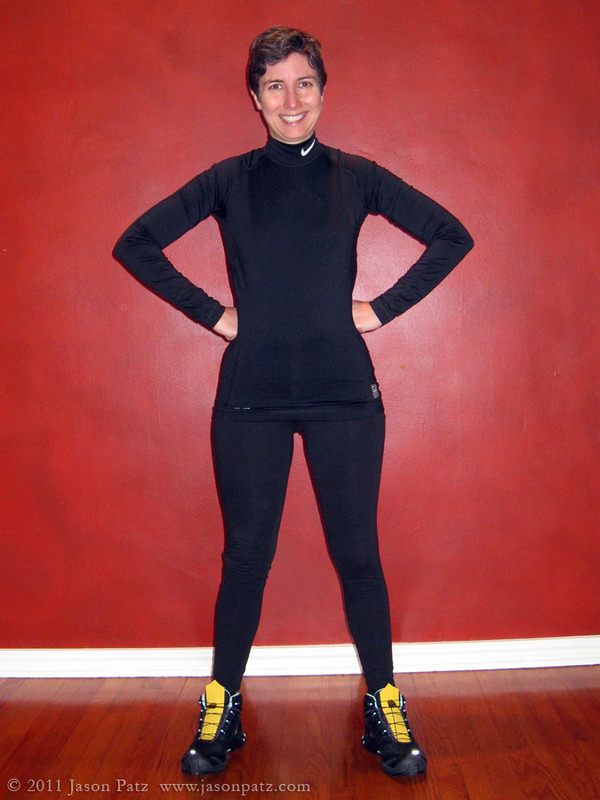 For my base layer I’ll wear a black long sleeve running shirt that I already own. It has a cool futuristic weave to the material which enhances the look. 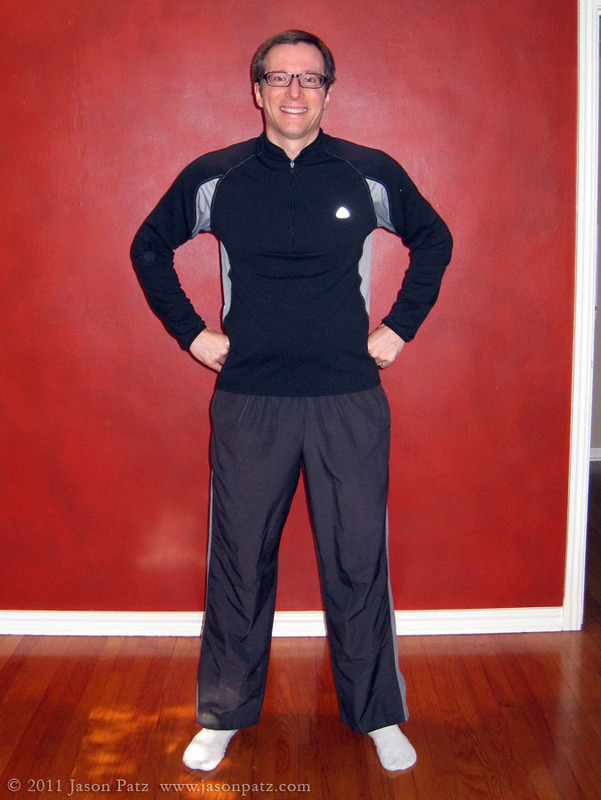 I have some grey running pants and black hiking boots that I will also wear. There you have it. 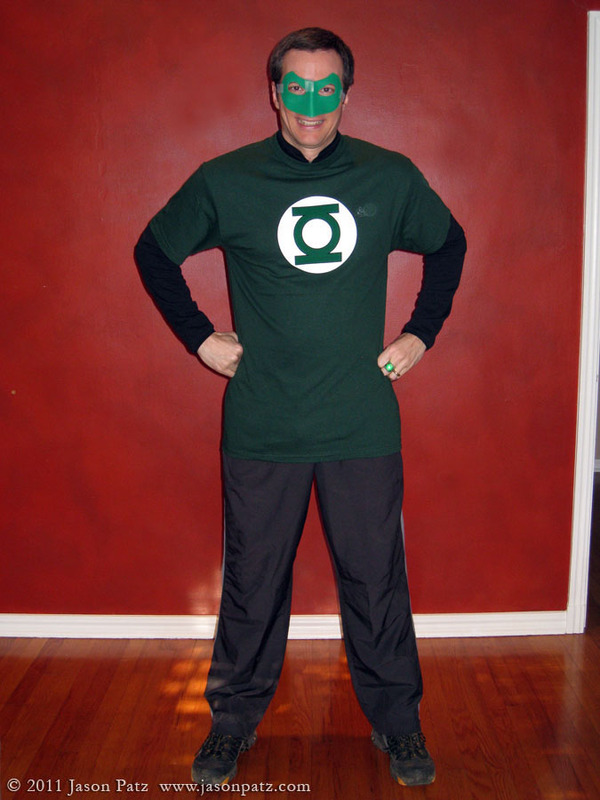 An affordable Green Lantern costume you can make in a weekend. Hold on! Ice cream is simple. With the right equipment and the recipes I’m about to give you, you can have soft serve sitting in your lap in about an hour. Step One – Get the right kind of ice cream maker. Unless you really love ice cream or have a large family, sell that giant beast of an ice cream maker lurking in the corner of the garage. You want a smaller, quicker and easier machine. We received the Cuisinart ICE-20 as a gift one year and it works great. It is such a simple device that I’m sure you can find something comparable for about $50 (example). “Can’t I just mix the ingredients together and stick them in my freezer? Then I don’t need an ice cream maker.” Only if you want a solid ice brick instead of ice cream. The ice cream maker freezes the concoction while it is whipping air into it. 3. Simple to set up, operate and clean. Step Two – Develop your base recipe. The first ice cream aha moment came when we made our first batch of vanilla. You freeze milk, cream, sugar and vanilla extract while whipping air into it. That’s all there is to it. Simple! My second aha moment was when I realized that pretty much every flavor of ice cream uses the same base and adds in different flavorings and those flavorings are usually in about the same proportions. Wow! That means you can get new flavors pretty true to what you want with very little experimenting. So let’s develop our base recipe first. Everyone has slightly different ideas about what ice cream should taste and feel like. Almost all of this is controlled by the amount of butterfat that is used. You can get butterfat from a number of dairy ingredients like whipping cream, 2% milk and so on. To keep things simple I recommend that you work with two sources: heavy cream (it has the highest concentration at 36%) and whole milk (3 to 4%). Try this recipe for vanilla first. 1. Freeze freezer bowl according to manufacturer’s instructions (probably overnight). 2. Keep all ingredients cold – store in refrigerator until just before using. 3. 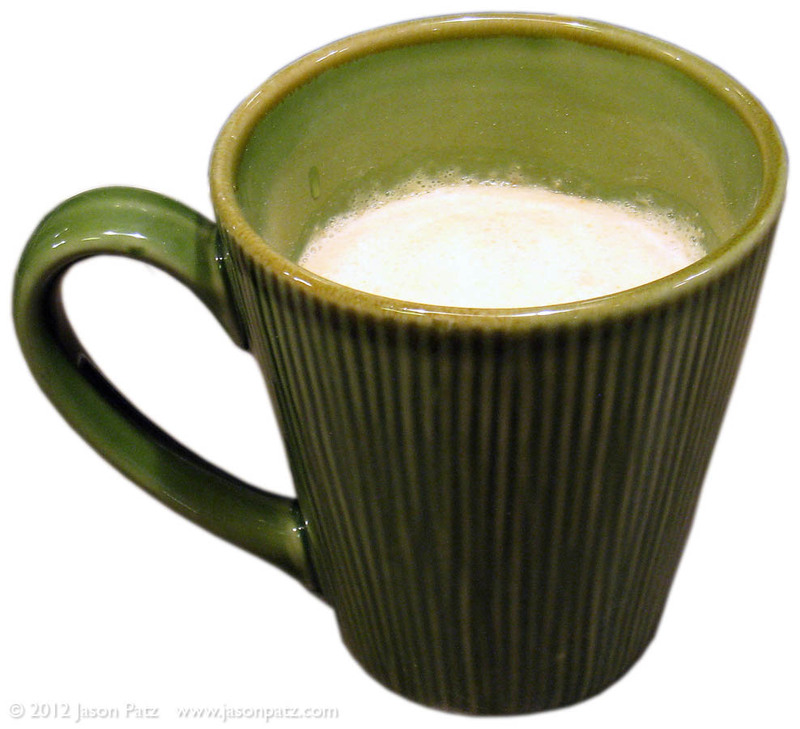 Mix milk and sugar in medium bowl on low speed for about two minutes until all sugar is dissolved. 4. Add cream and vanilla and mix about one minute until evenly incorporated. 5. Pour immediately into ice cream maker and operate according to manufacturer’s instructions until ice cream is thick and frozen (probably 30 minutes). 6. Eat immediately for soft serve. 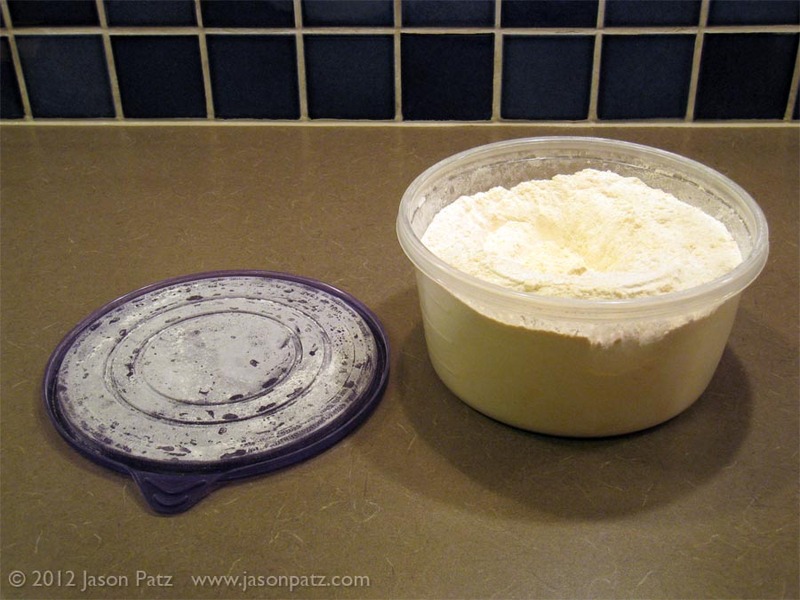 Transfer to container and place in freezer for about two hours for firmer ice cream. Next, modify the recipe to suit your tastes. 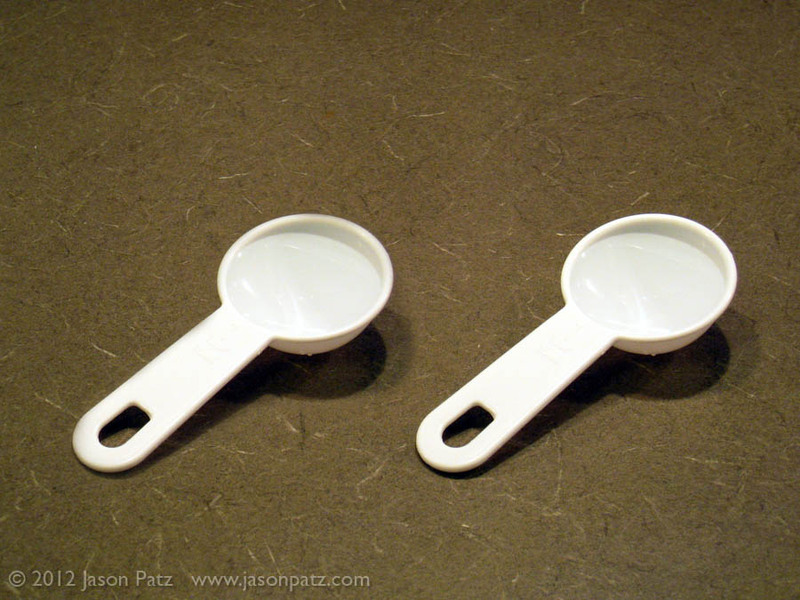 Most recipes call for two cups of heavy cream and one cup of whole milk. We thought that tasted great and was very smooth but it leaves a greasy feeling in your mouth. One cup of heavy cream and two cups of whole milk is acceptable but the ice cream begins to get a little more crunchy and I wouldn’t reduce the butterfat below this level. As you can see with our recipe above, we settled right in the middle. A note about eggs. The very best ice creams use eggs. Look on the side of Ben & Jerry’s and you’ll see them listed. Why are they there? Well, they serve as an emulsifier suspending all those little butterfat particles. They also impart a nice texture, increase the shelf life and aid in whipping air into the mixture. We don’t include them here because they are either added raw or really add complexity to the recipe when you cook them into a custard. You can make great tasting ice cream without them so we leave them out. 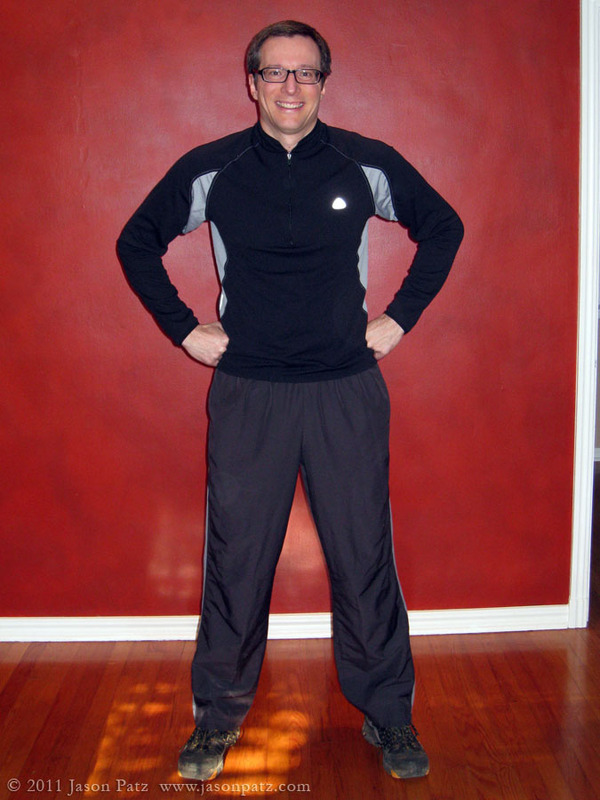 Step Three – Go crazy with the combo moves. You have your base tweaked just the way you like it. Now comes the fun part. Get creative and mix tasty stuff into it. 4. Add cream and peppermint and mix about one minute until evenly incorporated. 5. Pour immediately into ice cream maker and operate according to manufacturer’s instructions until ice cream is relatively thick but not completely frozen (probably 28 minutes). 6. Add Oreos and mix for two minutes until ice cream is thick and frozen. NOTE: You may need to remove a little of the base before adding the Oreos if your machine is small and whips in a lot of air. 7. Eat immediately for soft serve. Transfer to container and place in freezer for about two hours for firmer ice cream. 3. 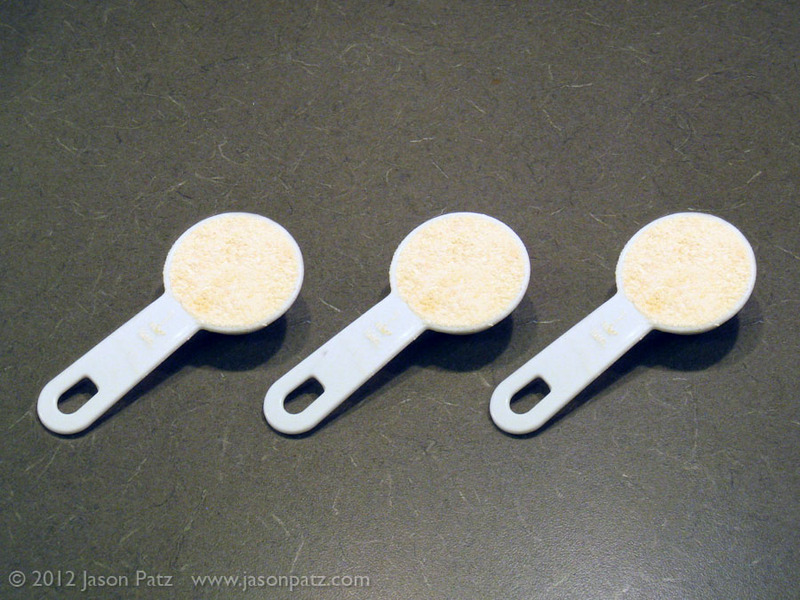 Mix milk, sugar and peanut butter in medium bowl on low speed for about two minutes until mixture is smooth. 6. Add PB minis and mix for two minutes until ice cream is thick and frozen. NOTE: You may need to remove a little of the base before adding the PB minis if your machine is small and whips in a lot of air. 3. Combine peaches, lemon juice and ½ cup of sugar in a medium bowl. Cover and refrigerate for 2 hours. Stir mixture occasionally (if desired). 4. Stir mixture and strain liquid into a separate bowl. Return peaches to refrigerator. 5. Mix peach juice, milk and remaining 1 cup of sugar in medium bowl on low speed for about two minutes until all sugar is dissolved. 6. Add cream and mix about one minute until evenly incorporated. 7. Pour immediately into ice cream maker and operate according to manufacturer’s instructions until ice cream is relatively thick but not completely frozen (probably 28 minutes). 8. Add peaches and mix for two minutes until ice cream is thick and frozen. NOTE: You may need to remove a little of the base before adding the peaches if your machine is small and whips in a lot of air. 9. Eat immediately for soft serve. Transfer to container and place in freezer for about two hours for firmer ice cream. Be sure to let me know about your fantastic cream creations. I’m always looking for an excuse to eat more ice cream. Update: Here are all four ice cream recipes on a one-page layout.